Ron Milam’s Not a Gentleman’s War: An Inside View of Junior Officers in the Vietnam War (University of North Carolina, 236 pp., $36.95), which was published in 2009, was written in reaction to the widespread belief that infantry lieutenants, such as the infamous William Calley (who presided over the My Lai Massacre), performed so badly in the field that they were one main reason for the outcome of that war. Milam—a history professor at Texas Tech University who served as an Army infantry adviser with the Montagnards in Vietnam—combed through Army and civilian reviews of junior officers’ leadership, conducted extensive interviews with former Vietnam War infantry lieutenants, and read many oral histories and diaries. That research, which Milam used as the basis for this book, brought him to a different conclusion. Among other things, Milam writes about Vietnam War junior Army officers who were very un-Calley-like. That group includes Chief Warrant Officer Hugh Thompson, the helicopter pilot who landed amid the carnage of My Lai and saved the lives of a group of Vietnamese women and children; Lt. Robert Ferguson of the 101st Airborne Division, who received a posthumous Distinguished Cross for his courage under fire in 1967; and Lt. Rick Rescorla, one of the heroes of the Battle of the Ia Drang Valley. 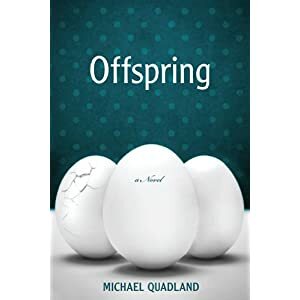 Michael Quadland’s Offspring (Red Hen Press, 224 pp., $18.95, paper) is a brilliant literary novel, with a gorgeous cover and great design throughout. Hank Preston is the main character. He is a Vietnam veteran unlike most we find in recent novels. It’s the mid-seventies, and Preston works in the Strand Bookstore, New York City’s famed used-book mecca, as a lowly shelver. He also has a part-time job as a sperm donor. One day when he shows up to donate sperm, he breaks the rule about riding in the elevator and meets the woman, Karen Allen Grave Tuckwell, who he is donating sperm to. The third main character of this novel is Hank’s boss, Joey Maxima, a transgendered person. The characters interact; mayhem of a very combustible nature ensues. I suspect that Quadland has no military experience, as the generic details about Hank’s tour of duty in Vietnam and his loss there of his best friend. Ted, to an explosion do not ring true to this reader. I admit that I spent no time in the jungles and little time in the rice paddies of Vietnam. But I was bothered enough by the wrong-footed details that I kept a list. When Hank got “a weekend furlough” to Saigon, that really bothered me. I’d already been troubled by the author’s description of Hank’s airplane trip to Vietnam and the landing there, but these grunts slept together every night in a tent that they closed with a zipper and ate cold noodles and broth out of a can. They might have done that, but they would have called it some kind of c ration. These grunt details seemed truer to the Boy Scout experience than to the Army experience. That said, I found Hank Preston to be a believable and likable character, albeit a tormented soul, and one this reader rooted for. I also rooted for Joey Maxima. But the third character, Karen Tuckwell, was too troubled for me to care much about or to think anything good was likely to happen for her. The story is told in alternating character-oriented chapters, allowing each of the three main characters to speak out for him or herself. This method worked just fine, once I figured out what was going on. Offspring held my attention the entire length of the novel, even though it is not a Vietnam War novel, and the war details stuck in my craw, which is a strong recommendation to a reader looking for a novel with a transgendered person and a positively characterized Vietnam vet, circa 1974. For me, the most consistently interesting part of the novel was the era in which it was set, and how well the author brought 1974 New York City alive. I suppose I should admit here that I was not in the Big Apple in 1974. In fact, I have never been there, not even once. But after reading Offspring, I feel as though I’ve spent hours in the Strand Bookstore browsing the history section. Lawrence T. Vosen’s Diamond on the Wall: Memoir of the Youngest Green Beret in Vietnam (1967-1968) (CreateSpace, 152 pp., $9.95, paper) is a handsome, well-designed book, easy and fun to read. Larry Vosen joined the Army at the age of seventeen and was eighteen when he arrived in Vietnam, on July 20, 1967. He was assigned to the 5th Special Forces Group Headquarters in Nha Trang, one of the most beautiful towns in Vietnam, where he worked in the Finance Department. Vosen provides a wealth of well-written and interesting details about that job and what he did in his off-hours to entertain himself. He played a lot of poker and won a lot of money, which he used to buy consumer goods such as Noritaki china and Seiko watches at the PX and through the PX catalog to send home to his loved ones. He also managed to be on a finance run to Saigon on the first day of the 1968 Tet Offensive. That section of the book is a thrill to read as the well-armed Volsen was one of the soldiers who helped defend one of Saigon’s best hotels from the VC. Someone had to do it. After a year in Nha Trang, Vosen transferred to a unit at Dak-Pek. The greatest part of his memoir relates to his service there working with a group of Montagnard Strikers in a Special Forces A-Team. The rest of his memoir is built around the recovery of the body of a Dust Off pilot, W1 James G. Zeimet, from Hill 851 where his helicopter crashed. That recovery mission and the complications of it make an engrossing read. The title of the memoir is a reference to the Vietnam War death of W1 Zeimet and the notice of it on The Wall in Washington. Unlike the authors of many other Vietnam War memoirs, Vosen chooses to take the reader back home to his family to show how he was embraced on his return. He thanks them for the warm welcome and for the celebration and continued loving acceptance he received. That was moving stuff for this reader. Vosen also says that “a lot of Vietnam veterans came home to spitting and anger and hatred and shouts of ‘baby killer.’” He does not say he did. And I know I did not. So who is that returning soldier who encountered all of these things? Somebody, I guess. Vosen also takes the time in this brief memoir to delineate the damage Agent Orange has done to those who served in Vietnam, as well as though who live there. I highly recommend this memoir to those readers who appreciate painful honesty and who have a curiosity about all aspects of the life of a Special Forces A-Team member in Vietnam. Leslie A. Chapman joined the Army in August of 1966 when he was eighteen years old. After Basic Training at Fort Ord and jump school at Fort Benning, he volunteered for Special Forces and went to Fort Bragg for Greet Beret training. “I took to the Army like a fish to water,” Chapman says in his detailed, combat-heavy, well-written memoir, Secret Soldiers of the Second Army (AuthorHouse, 386 pp., $30, hardcover; $19.99, paperback). Chapman put in four tours in Vietnam, the first with Company C, 5th Special Forces Group, and the following three with MACV’s Studies and Observations Group-Command and Control North (MACV-SOG-CCN) . He saw more than his share of action serving on deep-penetration recon missions and as a Forward Air Controller. Chapman received the Distinguished Service Cross, the Silver Star, and five Bronze Stars, among other medals. Les Chapman describes his war experiences evocatively. Here’s one passage, from Chapman’s first tour when he and his men mounted an assault on an NVA position after the enemy had been hit by napalm. “It felt like we were moving within the reels of a black and white movie,” Chapman writes. “We were right in the middle of a hornet’s nest. The mental stress was almost unbelievable. I looked over my left shoulder at our fourteen year old Baby-Son, the youngest member of our [ARVN group]. His eyes were filled with confusion and fear. Like the rest of us, he had no idea what he was facing. Frank J. Rafalko’s MH/CHAOS: The CIA’s Campaign Against the Radical New Left and the Black Panthers (Naval Institute, 352 pp., $32.95) is an insider’s account of the CIA’s 1967-73 secret domestic spying program started by President Lyndon B. Johnson during the height of the Vietnam War. Rafalko went to work for the CIA’s Special Operations Group (SOG), known around the agency as MHCHAOS or Operation CHAOS, soon after joining the agency in July of 1967. He went on to put in a twenty-four-year CIA career. During the late sixties and early seventies Counterinsurgency Officer Rafalko’s job was to help uncover foreign influences on the antiwar movement. Part of that effort included undercover agents who spied on U.S. citizens abroad and infiltrated antiwar groups such as SDS and the Black Panther Party at home, looking for connections to operatives from the Soviet Union, China, and North Vietnam. Operation CHAOS also spied on a wide range of left-of-center activists and other groups that had little or nothing to do with opposing the Vietnam War. The latter included women’s groups. All in all, CHAOS maintained files on some 7,000 individuals and 1,000 groups and organizations. Operation CHAOS became extremely controversial after its domestic spying came to light in 1974 through an article by Seymour Hersh in The New York Times. That led to congressional hearings and then a federal investigation by the Rockefeller Commission that looked into the legality of the domestic spying. Many were outraged after the congressional hearings and Rockefeller Commission’s final report revealed the details of the operation. Rafalko, though, believes that what he and his undercover colleagues did—including spying on the antiwar movement—was legal and correct. That’s the reason his Southeast Asia details ring true to this reader. Few American Vietnam War-related novels begin with an epigram from Ho Chi Minh, “Nothing is more important than independence and liberty.” This sets the tone for this action-packed adventure tale. Our hero, Steve Conway, is an Australian Vietnam veteran who fought in the Battle of Long Tan, and lost friends there. His return to Vietnam is fraught with emotion, especially his visit to the site where his friends died long ago. Conway falls in love with Kim, a young Vietnamese who seems to return that affection promptly and with little or no good reason this reader can see. In fact, every woman in the novel seems smitten with Conway—fromtwenty-somethings to fit old grannies—and eager to bed him. Danger soon enough asserts itself from more than one quarter. There are two bad guys in this novel, a stereotypical Marine Corps Vietnam veteran, described as a psycho with PTSD. He tries to kill Conway with a Ruger M40 semi-automatic rifle. No serious attempt is made to try to individualize Marvin the Marine. He’s the standard-issue crazed Vietnam vet we’ve had foisted off on us too often in popular literature and movies since the early 1980’s. The other bad guy is a vicious and jealous Vietnamese fellow who tries to kill Conway via hit and run. Conway sticks around Saigon for longer than he intended due to his love for Kim, and decides that his hotel business would profit from opening a new one in Vietnam. The plot contrivances and coincidences seem hatched straight out of the Thackeray era. The book contained a couple of howlers, including this one: “The U. S. is now looking after its Vietnam vets.” I hadn’t noticed. 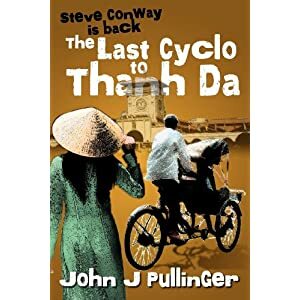 We are told that the next Steve Conway novel is The Last Tuk Tuk to Bank Na, and that it takes place in Bangkok. Last Cyclo is a beautifully designed book with a gorgeous cover. You might like it. The Dryline (The Small Press, $16.99, paper) is the second book by Retired Army Brigadier General Jack Grubbs in his Seiler Murder Mystery Series, a projected trilogy. Grubbs served two tours in Vietnam and did 35 years of active duty in the U. S. Army. He also has a PhD from Rensselaer Polytechnic Institute, which explains how he can provide his character, Tom Seiler, with believable and mind-numbing expertise to help his brother design an oil-extraction system that becomes much sought after by bad guys. The plot involves ruthless oilmen who think nothing of premeditated multiple murder to get their hands on the Seiler oil-extraction system, which both good guys and bad guys are convinced will result in billions of dollars being made by the lucky patent holder. The book is all about who is going to end up with the patent—the Seilers who did all the inventing and designing, or the bad guys, who do the killing and conniving. The book held my attention throughout, and it even had a couple of well-drawn canine characters, Catfish and Bear. The character and geography of Luling, Texas, came alive for this reader, and sometimes the book seemed more like an ethnography than a mystery. Chapter 55, “The Watermelon Thump,” went on and on and did little to advance the plot. I learned more about what people eat in South Texas what kind of music they play at social gatherings than I wanted to know, but the very next chapter started with a bang, which redeemed that section of the book. Now that I’ve read this book, I will not need to visit Texas again. It’s no surprise that with a sentence like, “It’s every Texan’s right to hold a burger in one hand and a beer in the other,” lots of beer gets drunk, much meat is eaten, and large quantities of blood are shed in a brutal manner. Vietnam veterans are sprinkled throughout the book, and they are never portrayed as evil, which I found a refreshing departure from most mystery novels that include Vietnam War veterans. If you are searching for a techno-mystery to read that is set in Texas, give this one a chance. Despite the high praise that one character gives to the current Texas governor, I kept reading until the end. That’s high praise for the engrossing plot.